Amsterdam, Cape Town, 20 November 2018 – The March for Our Lives initiators, who started the American mass youth movement for safer schools and communities and against gun violence, have won the International Children’s Peace Prize 2018. 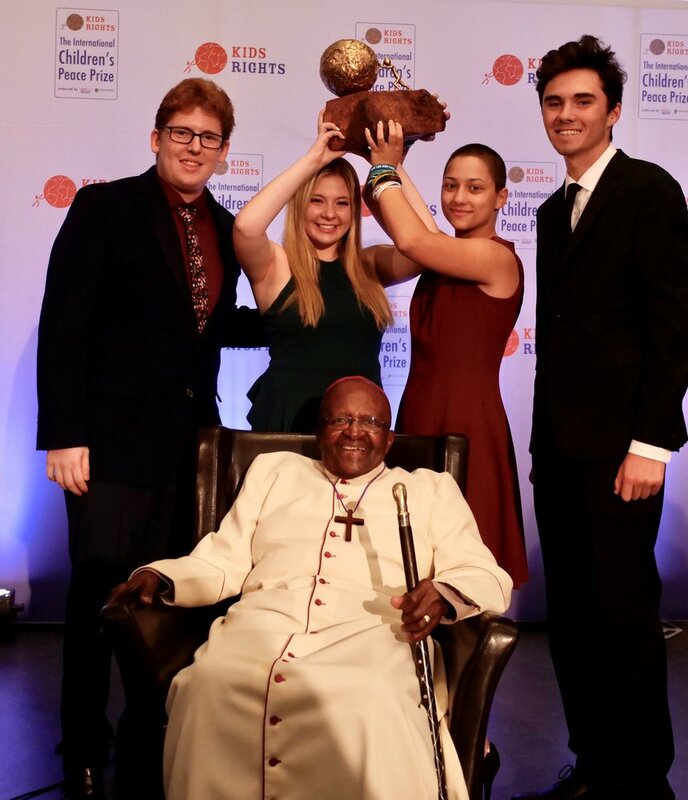 Today, on Universal Children’s Day, David Hogg, Emma González, Jaclyn Corin and Matt Deitsch, received the prize from Archbishop Desmond Tutu during a special ceremony held in Cape Town, South Africa in the presence of distinguished guests and the world press. The International Children’s Peace Prize is an initiative of the international children’s rights organization KidsRights. The young winner’s message each year reaches millions of people worldwide. David, Emma, Jaclyn and Matt co-initiated March For Our Lives alongside more than 20 other students, after their school was the scene of a mass shooting in Parkland, Florida this past February, with 17 fatal casualties. Personally affected by the tragedy, they responded by organizing the March For Our Lives event in the spring of 2018 to demand safer schools and communities and to protest gun violence. Hundreds of thousands participated in the rally and more than 800 sister marches took place that same day across the US and beyond. For David, Emma, Jaclyn and Matt, this was only the beginning. In the summer of 2018 the group took to the road, visiting 80 communities in 24 states leading discussions and advocating for the creation of safer communities. They lobbied, held town hall rallies, and motivated thousands of young people to register to vote. The March For Our Lives movement has continued to be highly vocal and very successful. Since its advent, over 25 US states have passed more than 50 pieces of legislation in line with their cause. Additional background documents and information are available in KidsRights’ dedicated online newsroom: kidsrights.pr.co. In honour of the International Children’s Peace Prize 2018, KidsRights has written the report Not a Battleground: School Shootings and the Right to a Safe and Protective Environment. Schools must be a safe haven for children, and too often they are not. Children around the world are exposed to all kinds of violence at school, from bullying and peer violence, to attacks from armed militia. However, children living in conflict zones are not the only ones with reason to feel unsafe at school. School shootings have become disturbingly commonplace even in communities far removed from war. In the report, KidsRights calls for data collection at the national level, as well as research and funding to develop interventions to prevent violence in schools. The world needs to listen to children and young people, to respect their right to safety and to identify the way back to peace in schools.